The big shift in recent years is that business is more personal, and messaging apps have been on the rise. But what do you do if you're not equipped to operate 24/7, or don't have the bandwidth to respond to every question as quickly as you'd like? Before founding Continually, I worked on new products inside a larger company, at a fast growing startup and as CEO of a boutique digital agency. I saw in each of those environments how many businesses work so hard to craft delightful products. That they invest heavily in attracting customers. But the experience those customers get when they are interested in buying falls short. They way we have thought about marketing hasn’t caught up with the way that each of uses technology to communicate. Today, when buyers get in touch through your website - say to request a product demo - they expect you to reply quickly, even out of hours or when they’re in a different time zone.But most website make customers fill out forms that ask for too much information. They’re unfriendly, impersonal and you don’t know when you hear back. I saw this first hand when I was working for another company, building new products. I would get so excited when a potential customer, like Facebook or Snapchat, was interested in using what we’d built. And I’d hate it when our sales teams took too long to respond. The problem is that it’s expensive to have highly skilled sales staff always available to reply. Customers expect to get answers quickly. Which can be challenging when your customers can come from countries all around the world. What if there was a way to help people who need it, even when you’re not there? Or you could come into the office in the morning to meetings booked the night before? So, for B2B software companies who want more qualified leads without the expense of additional sales people, Continually lets you add a single line of code to your website and start automatically replying to customers in just 60 seconds. Then when leads do arrive in your inbox, or on your calendar, we give you all the information you need about that person to close the business. We’re already live with some early pilot users. 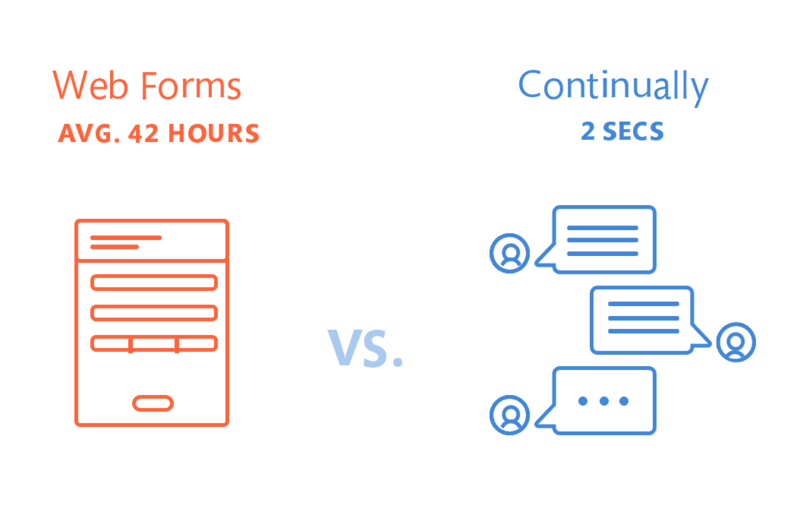 One of our first users compared their lead flow against their old manual process, and found they got twice as many leads with Continually. We’re excited because this is a big, growing market. There are millions of websites using tools like web forms and outbound email to generate leads. 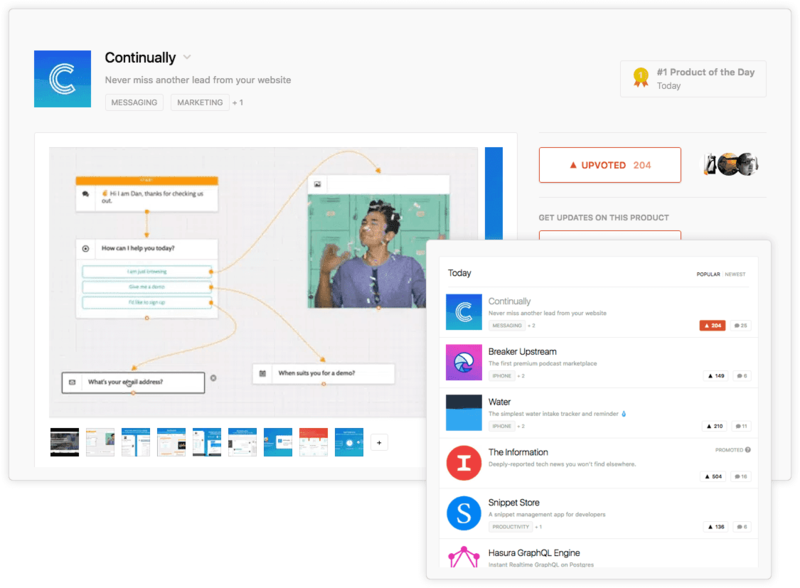 Our team has worked together before and we’re using all of that experience building product to make Continually really simple and really to use. 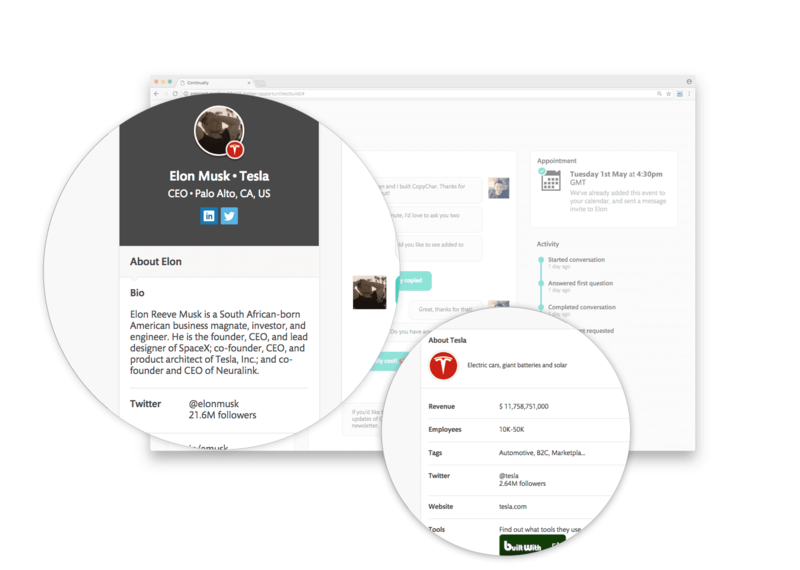 I mentioned we’re onboarding early pilot users and anyone who signs up now will get extra love and attention. You can check out the discussion and reviews from early users on producthunt.com or sign up to get started.